Owner Bob Kraft is in no doubt that New England Patriots star Tom Brady is the best quarter-back to have ever played the game. New England Patriots owner Bob Kraft says quarterback Tom Brady is the greatest of all time ahead of Sunday’s AFC Championship game against the Kansas City Chiefs (Kansas City Chiefs 4/7, New England Patriots 7/5 – Championship Games Money Lines). Brady is a five-time Super Bowl winner, with all of his successes coming with the Patriots, and Kraft feels the 41-year-old is the best to have ever played the game. “[Brady is] Definitely the greatest of all time, not just quarterback in my opinion,” Kraft told ESPN of Brady. “Because he’s such a leader in the locker room. He added: “He’s a genuine person. He’s kind. He’s polite to everyone. He’s a very caring person. At the same time, no one works harder or watches more film. “What a great example for young kids who come into the locker room, they were five or six years old watching him, or in their teens. The Patriots edged a high-scoring game 43-40 over the Chiefs in week six of the regular season, although that was with home-field advantage at Gillette Stadium, with Sunday’s encounter taking place at Arrowhead. New Orleans and Los Angeles have also met once this season with the Saints, who again have home advantage as the top seeds, coming out on top in a shootout 45-35 in week nine. Brady, Patrick Mahomes II, Jared Goff and Drew Brees all to throw 2+ touchdown passes is 10/3 in the #PickYourPunt Championship Games Specials and all four teams to score 3+ touchdowns is 15/4. 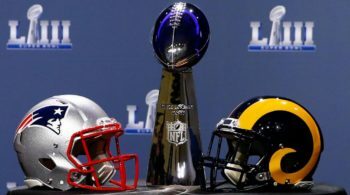 The Patriots and the Rams are both available at 7/2 to win the Super Bowl, the Chiefs are 5/2 and New Orleans Saints are the 15/8 favourites.